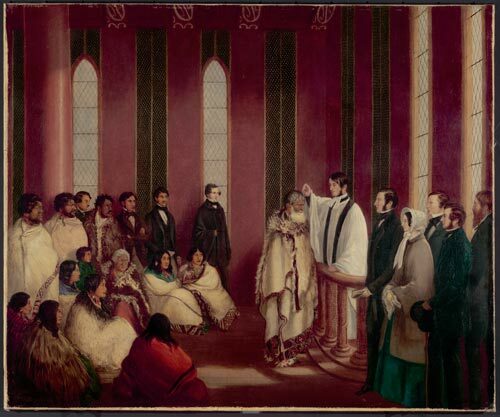 This 1853 painting shows the baptism of the leading Te Āti Awa chief Te Puni by the Reverend Octavius Hadfield, an Anglican missionary. The old chief lived by Wellington Harbour at the site of present-day Petone, and was baptised there in 1852. However, the ceremony is shown here in the more impressive surroundings of Rangiātea, Hadfield's church at Ōtaki. Standing behind the minister are Governor George Grey and his wife Eliza. Grey commissioned this painting, perhaps to record the assimilation of Māori into European settler society.